DALI Zensor 5 AX review | What Hi-Fi? Sometimes in hi-fi, you need perseverance to get the best results. But like most things that take a little effort, the rewards you’ll reap when you do are absolutely worth it. The Dali Zensor 5 AXs are a bit like that. 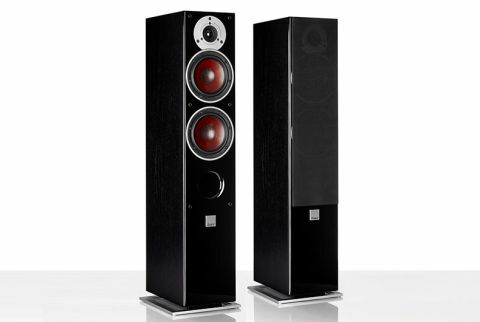 A powered pair of floorstanders, it’s in their nature to be plug and play – to be up and running with minimum fuss. In many ways they are, but take care with set-up and these speakers will shine. At a glance, the speakers themselves look just like their passive siblings save for a small LED on the left master speaker that informs you of what input is selected. This master speaker holds the brains of the setup, including the 50W-per-channel Class D amplifier, a choice of physical inputs and the wireless components for Bluetooth. Just this speaker needs to be connected to mains power, and then to the right speaker – essentially a standard Zensor 5 – by a single speaker cable, which is included. Since the crossover remains passive, they’re a powered set-up rather than truly active, splitting the amplified signal to the 13cm wood fibre cone woofer and 25mm soft dome tweeter in each cabinet. It’s a traditional form factor for what is ultimately a very modern solution. For a similar price, you could buy the Naim Mu-so – a much smaller and less obtrusive option, but also less capable of reproducing the sound and stereo image a set-up like the Dalis can provide. There isn’t the biggest choice of inputs – just 3.5mm aux, digital optical and apt-X Bluetooth – but that’s probably enough. It means you can hook up portable devices or a laptop via the mini jack, and a CD player or even your TV via the optical. One thing’s for sure – you won’t find a soundbar that comes close in terms of sound. We set them up, connect our Cyrus CDi CD player and place them in our standard speaker position, well away from the rear wall of our testing room. They are unmistakably Dali. Fast, detailed and enthusiastic, they offer a bigger, better sound than any one-box solution at this price. But there are niggles – the bass lacks some punch and definition and the treble isn’t the most refined either. We try them close to the back wall of our testing room, with no toe-in. Immediately the previously soft bass shapes up and sounds more solid. Leading low notes have more definition to their edges and there’s more confidence in the lower register overall. There could still be a touch more kick to the lower bass notes, but it’s a huge improvement to our first listen, and one that helps to deliver improved solidity and richness across the rest of the frequency range. One grumble fixed, we address the next one. Though the treble is calmer with the new placement closer to the wall, we still find it a touch too lively over longer listening sessions, and less than forgiving with coarser recordings and Bluetooth. We switch out the included speaker cable for a better quality one – we’d recommend the Award-winning Chord Clearway at £10/m – and the difference is undeniable. The White Stripes song that had previously sounded hard and unrelenting still sounds suitably manic, but is better expressed. It’s a credit to the 5 AXs just how transparent they are to every single component in your system, but also a consideration. You’re going to want to feed them the best source you can to get the best from them, and consider your cabling too. With the 5AXs sounding better balanced and more assured, we settle back for further listening and continue to be impressed. It’s a clean, thoroughly articulate performance, with voices sounding warm, natural and filled with expression. There’s loads of detail to go at, and while they aren’t the biggest sounding floorstanders we’ve heard at this level, they’re still plenty spacious and handle scale and dynamics with verve. Toning down that treble hasn’t taken away any of their ability to entertain either, with a fun and lively tone and a strong sense of timing, even with complex rhythmic patterns. The improved bass has helped with this too, and its more convincing presence here delivers a much fuller bodied and authoritative presentation across the board. We take a listen over Bluetooth and notice some expected compromises – it’s a smaller sound with some loss of detail and refinement – but it’s still a hugely enjoyable listen that holds true to the 5 AXs’ cohesive and engaging musical character. We wouldn’t think twice about using it. The Dali Zensor 5 AXs are a strong reminder that you can’t always judge hi-fi by its first listen. Running in and system matching are both very important, but also taking care with placement and accessories can make all the difference too. We liked the Zensor 5 AX when we first heard them, but by the end of our time with them, we loved them. They’re a real success, delivering all the convenience of a one-box solution in something altogether more hi-fi. Spend some time getting them just right, and the best of both worlds is well within reach.